For those of you who are on facebook, please join this poll. Just imagine, hypothetically, that there would be a new development tank on the market, designed for 8mm and 16mm films of 50 or 100ft length. Would you ne interested in buying such a thing? And what would be the most important options for you? Are you talking about an ECN-2 processor with a remjet removal step? I'm quite certain this is for processing films without remjet, E-6 and BW processes. A metal spool or a plastic design that can be wet-loaded would be great... that way if you have a way to remove remjet then you could do that then load the film onto the spiral wet. Intersting find Antonio. I wonder what the original application or use was. The 200' spiral I used to have was used by a TV film cameraman working around the time that broadcast TV started in New Zealand. Live TV using, I think, tube cameras, was simultaneously recorded onto 16mm, processed on this stainless open spiral, then the film was quickly flown to the next city so that the delayed live show could be broadcast. The telercording film, I processed quite a lot as camera stock, was very fine grained, not very dense blacks, orthochromatic (blue sensitive). The idea of a spiral tank suits the modern paradigm (over identified modality of thought) where everyone wants to own for themselves. But if a small co-operative group work together, a modest continuous B&W processor may be possible. They can be quite primitive physically, the replenishment drips being just small clamps on the plastic feeder tubes for example. Indeed It was Gregg, but I don't remember where I found those images. I guess it was used for the same application as your spiral. Do you still own that 200 ft spiral? Can you post some pictures? For the Aaton Minima loads is great. I am very interested in getting to process myself. I have access to Lomo tanks and Morse ones but for longer loads thats a problem. I am part of a local co-operative. It will be great to have a process, primitive as may be. How do you imagine that feeder? Like the ones in pro labs? I used baking soda for that with great results. I saw it on the web and tried it. I used borax before but it was too dangerous and not environmentally friendly. It is just and additonal step in the process. Antonio, I worked with friends in the 80s who had such a continuous B&W reversal processor. They began with an existing factory made one, about 1200x500x1200 size. It wasn't very fast but that didn't really matter. You can calculate the speed required by the immersion time and the developer etc. They threw out the original tanks and made new ones from PVC pipe, with some connecting tubes at the bottom for some. They kept the origional drive system, which used a rubber surfaced friction drive rollers on the drive shaft at the top. The other rollers were factory made 16/35 ones I think, with the bottom roller on a wire shaft so that one could controll the immersion time easily. I think there was a heater in the bottom bath that housed the tanks, so that controlling temperature was not hard. There was a magazine from a (contact?) printer on the feed end, and a take up system like from a projector on the output end. There were some plastic squeeges sourced from the industry. The only problem I remember from the results was that we sometimes got feint grey spots from the ping pong bat rubber we had used on the drive rollers. Personally, I wonder if a single drive sprocket at the output end might be OK for such a small processor. But I'm sure friction rollers are OK if done right. It would be great to have the resources and skills to build such a thing! I own a Morse tank and I have access to Lomo tanks but still, the loads are limited. Hopefully a solution will be around the corner. In the mean time, I keep on thinking about how to process bigger film loads. I was thinking to buy it some time ago. That L & F processor looks really interesting, if in fact it was actually sold and used ? In those days of course (early 60s ?) $675 was a lot of money. It would be several thousand now maybe. I'm not sure we really need another Lomo type tank. OK it would be made of better plastic material, but I think it would be best to concentrate on manufacturing a simple kind of open drum like they used back in pre-war days, but rotating on bearings in a light-proof container. Ideally you could also load it in daylight, but maybe feeding the film in the dark is easier, if a darkroom is available. It could be hand-turned but for a few dollars more you could add a motor. A trough in the light-proof housing contains the chemicals which can be quickly drained and added through hoses. Maybe the whole thing could stand in a tray of water sitting on a darkroom heater. But the actual processor could be made for not too much money, if there was enough demand worldwide. The open drum could be adjustable for 8, 16 and 35mm. 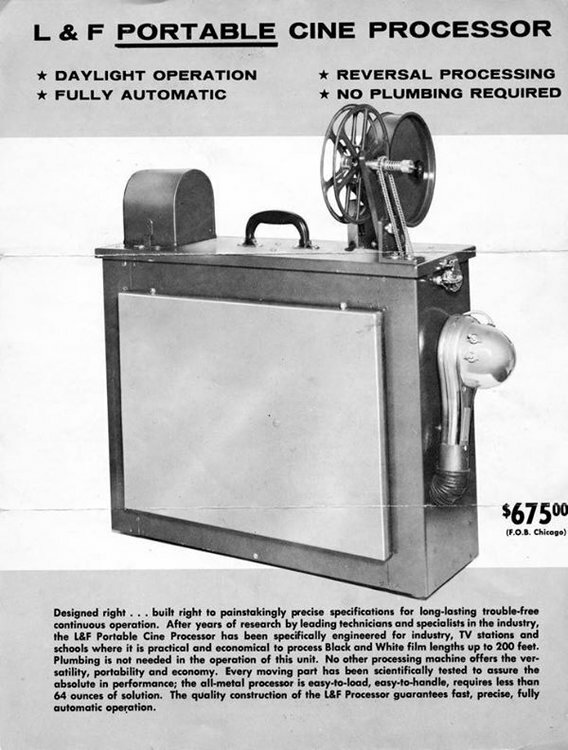 A new-in-the-box L & F Cine Processor like the one shown above sold at eBay last year for $500.00. It would've been a big improvement over my Morse G-3 tank (and its Arkay clone), but I didn't see it in time. Micro-Record made a motorized film processor that, as I recall, looked like the Morse, but I've been unable to find one. I'd be interested in an affordable and reliable motorized processor handling film in 8mm and 16mm widths. Has anyone used the Jobo CPP3 processor with a Super 8 processing drum (code EXPERT)? I use a Jobo CPE 2 processor with a custom built rack to process colour reversal Super 8, it's very easy to use and the results are very good. For Super 8mm we bought the JOBO 3018 Expert Super 8 Drum (costs 850 Euros) for our CPP 2 processor. But we still had no time to use it. I think I will use it with E-6 and also with D-94 A. I also want to test Kodak Vision 3 with the Remjet removal chemistry and the C-41 process. I am exiting how good the results will be. 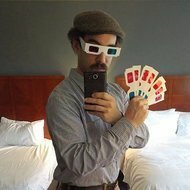 Friedemann Wachsmuth has there some really interesting films and articles on his website! It would be very nice to have a drum for 16mm 100 feet for a CPP 2 and the other JOBO processors. I would buy it! Normally I give 16mm and 35mm to a lab. But to make some experiments in the development a tank for 16mm 100 feet would be very interesting. But without cutting in a half!!! But if you only have a tank like the Lomo tank, then it must be cheap, because then you cannot get constant results in the color processes. And if you will build an own new processor, which costs very much, then I think it is only interesting if you can feed it with 400 feet and also 35mm (motion picture film). Then it would be a nice option to make some crazy experiments with "natural" developers. I want to test some of this "natural" developers first with 35mm photo film. But how nice it would be to make a redwine development with 16mm 100 feet! With this I mean redwine, caffeol and so on. This unit just has no RemJet Removal Part. The Idea with a 1000foot spiral would be awesome as the spiral could be dunked into the tanks by a robotic arm. You just would need to place round tanks around the robotic arm (360°) 8 tanks would be enough as the 3 different washing processes (after stop, after bleach, after fixer) could be done inside the same tank. This is currently my thing im seriously working on. A 100 foot spiral tank like the Lomo Pro is great, if available. The metal spiral for 100 to 200 feet would be an alternative. Stacking spirals would be nice, too. That would be a good start. 100 feet of black and white 8/16/35mm film. A 400 foot machine of some sort would be next to try. Then, rem-jet removal and color processing. One thing at a time. I never actually used it. The thing works fine as it is. Following this thread now -- Michael, by coincidence I just today found your listing for that Micro Record on you-know-where-Bay before I saw your post here! It's quite the odd little machine but I'm not sure what amounts to a motorized Bakelite box is comparable in selling price to some of the industrial build quality continuous processors out there like the L & F listed above. I'm trying to acquire something similar to one of those to use for student processing at our university right now. 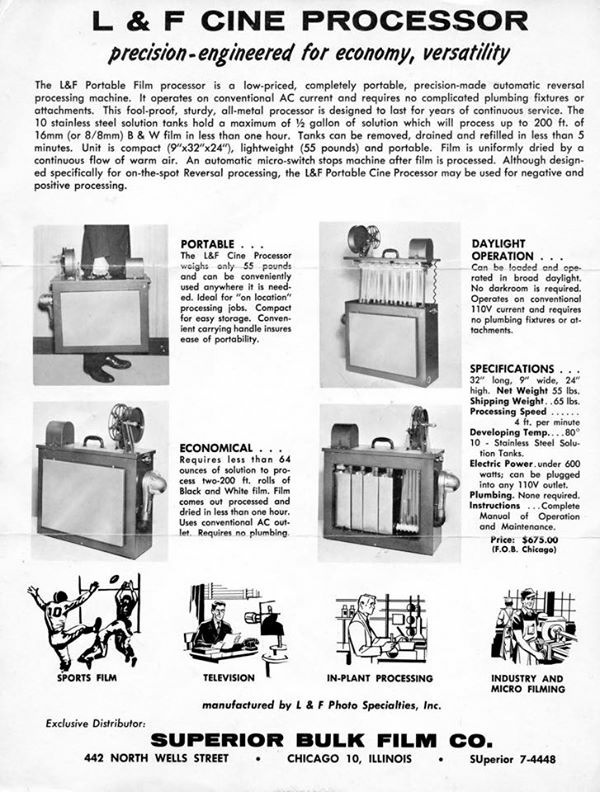 Speaking of which, check out this original brochure I found for the L & F Cine Processor on Archive.org! The file was uploaded from an amazing repository of odd photographic industry materials kept in "junk mail" boxes for decades by entrepreneur Ted Nelson, the guy who coined the term "hypertext." It's also the only place on the entire Internet I've ever found decent reference information on the 35mm "Automax" cameras made by Neyhart Enterprises / the Traid Corp. for the Air Force, NASA, etc. Also, Friedemann, you might get some ideas from this YouTube video -- I've seen photos of the insides of these sorts of processors, but this is the only extensive "video tour" of a portable "Entwicklungsgerät" innards (yes the video's in German) that I've found. I have no idea where to buy industrial film processors. Hollywood? I do not have room for one. I knew a guy who had a Craimer, sp? , I saw one in a camera shop outside McKeesport and it was really big. It wouldn't fit into my cellar. This processor works in the dark by lifting it from one tub to another. A 400 foot industrial model is optimal including the dryer. David Bendiksen, There is or was yesterday a microfilm 16mm processor for sale on the Bay. The one I have would not be ideal for students. They cannot easily work in total darkness as required. Rather, I would teach them to develop 8mm/16/ films in a small Jobo tank with 110 reels. That is the way I did most all my tests.